DMT F70F Mini-Sharp® portable diamond sharpener. Diamond Mini-Sharp Sharpener - a Diamond Whetstone that travels with you. Folding handle protects the stone when not in use. Lightweight and ultra portable, handy key chain swivel ring for your keys or attach to zipper pulls or backpacks. Fine diamond (25 micron / 600 mesh) for a razor sharp edge. Sharpening with diamonds is fast and easy. No messy oils needed sharpen dry or with water. Durable construction will provide years of consistent performance and reliable service For proper tool maintenance, woodworkers, chefs and other professionals rely on the superior quality and versatility of DMT products. Made in USA. Handy size: 5 1/2" (140mm) opened. Size of stone: 2 11/16" x 15/16" x 3/16" (70mm x 25mm x 4mm). 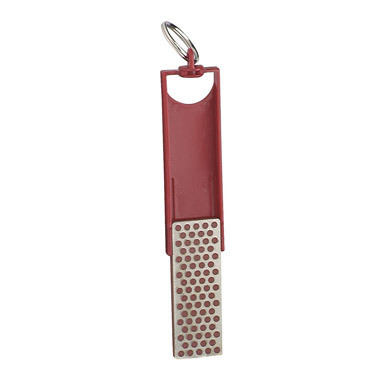 Ultra portable, key chain sharpener. Fine diamond for a razor sharp edge.